Gods, deities, symbolism, deposition, cosmology and intentionality are all features of the study of early ritual and cult. Archaeology has great difficulties in providing satisfactory interpretation or recognition of these elusive but important parts of ancient society, and methodologies are often poorly equipped to explore the evidence. This collection of papers explores a wide range of prehistoric and early historic archaeological contexts from Britain, Europe and beyond, where monuments, architectural structures, megaliths, art, caves, ritual activity and symbolic remains offer exciting glimpses into ancient belief systems and cult behaviour. 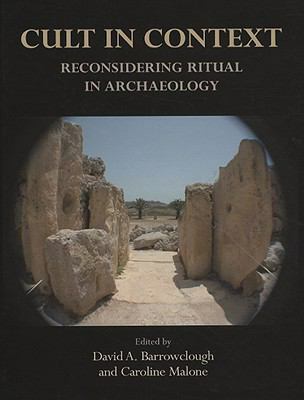 Different theoretical and practical approaches are demonstrated, offering both new directions and considered conclusions to the many problems of studying the archaeology of cult and ritual. Central to the volume is an exploration of early Malta and its intriguing Temple Culture, set in a broad perspective by the discussion and theoretical approaches presented in different geographical and chronological contexts.Barrowclough, David A. is the author of 'Cult in Context', published 2007 under ISBN 9781842173039 and ISBN 1842173030. Loading marketplace prices 1 copies from $194.29 How does the rental process work?